After I reviewed the StealthCam P12, Stealth Cam was nice enough to send a G30 for me to test in anticipation of the upcoming whitetail season. The G30 is a bit nicer with a few more features. I parked both under a tree out at the family ranch for a few weeks to see what I could capture. I didn’t put any bait out or try to entice any animals in any way. I just parked two cameras, one atop the other, to see what would show up over the course of three weeks. As you can see above, one of our horses wanted to check things out . . .
Actually, a lot of the pictures I found on the cameras, some 400 or so in all were of my family’s herd of rescue horses. It turns out that this mudhole is a really popular spot for them to come roll around in as you can see above. There’s also a family of raccoons that stopped by several times to munch on acorns. You’ll notice that the cameras appear to be pointed in different directions as time goes on. That’s because the horses felt it was necessary to use my cameras for scratching posts. I apologize in advance for some of the canted shots. This was one of my favorites as the camera was focused more on the background than the foreground making for a striking silhouette. The light is just about perfect and sunrise is in full swing. Four days later, the P12 captured one of my favorite series. Over the course of two minutes, the P12 captured a great moment as a group of young bucks foraged and fought. Something spooked them, and off they went. I did spot a very large spike buck in the group which means I’ll be using up one of my buck tags culling off a genetically inferior deer. I don’t really care that much, but my neighbors have hunters who pay to come hunt and they expect good looking deer. Spikes are inferior and therefore must be eliminated. I consider it a neighborly service. But the best surprise was seeing this fantastic looking whitetail buck. Because the family ranch is low fenced and we, along with our neighbors, do very little supplemental feeding in the spring and summer, we grow a different looking whitetail buck than you see in the magazines. Typified by thinner antler beams (seen with the fighting bucks above), less developed bodies, and easiest to spot, under formed G1 tines. 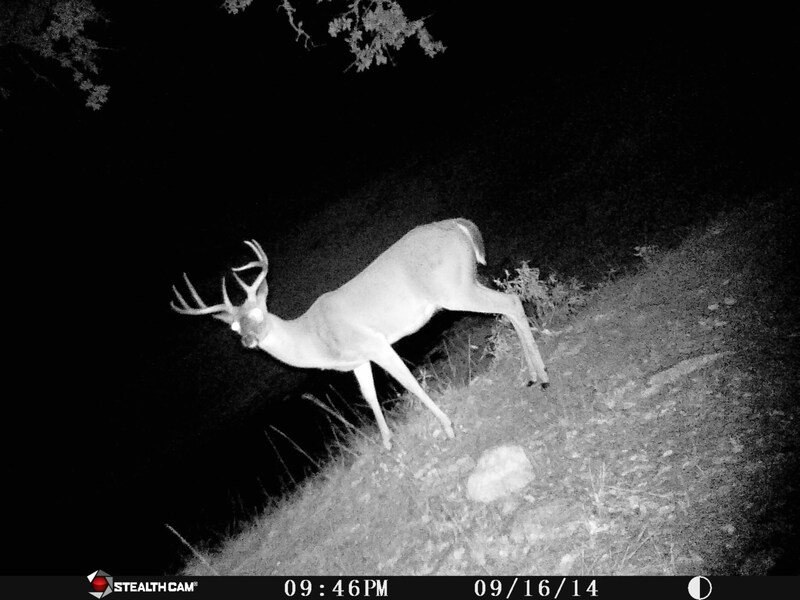 The buck above however is atypical for the area as he sports fairly thick beams and very well developed G1s. His body is also excellent and I expect that he’ll gain a bit more weight as the fall progresses. I hope I get to see him again in the light of day. The camera also spotted several exotics including this young Axis buck who was following around a herd of Axis does. They showed up several times over the course of the three week period and this buck was with them each time. I never saw any truly large Axis, but this little guy was definitely hanging out in the neighborhood. Speaking of exotics, we’ve had two Blackbuck antelope roaming around the ranch for the last year or so. They both appear to be about the same size, but they rarely stay still so I’ve had a difficult time scoring them. Luckily, the P12 snapped this photo of one of the bucks head down so I was finally able to count the number of curls in his horns. This picture is of the current record holder with the #3 world record buck measuring 80 & 4/8 inches. Bronze class minimum is 54″ I don’t think either of these bucks are bronze class, but I’ve heard from several people that one of them will have to go lest they kill each other. Hopefully I’ll get a good shot on them once it cools down a bit. Blackbuck meat is good eating and I want it to be cold to optimize meat quality. And finally, a photo of one of those hogs that everyone keeps talking about. This one was trucking along and barely was out of frame before the G30 picked it up. There are no other photos of this pig on either of the cameras but my parents have told me multiple times about a white pig with spots so they weren’t pulling my leg. Given the on the ground reports, and seeing this pig on camera, I’ll be at the ready with my AR any time I’m at the ranch in case I spot one. It was so great to come back after three weeks and see so much action on the cameras. I think I’ve found my new honey hole hunting spot as it seems to get nearly daily action and a great variety of wildlife. Really enjoying this. I’m looking at upgrading my trail cams. I like the trigger speed of that G30. Catching a trotting hog is a great testament to that. I’m torn about it because they’re both so good looking and fun to watch, but they’re both vying for “top goat” spot and I know one of them will die and the other will likely get torn up. They’ve already destroyed some fence fighting each other. But then I remember how good Blackbuck stroganoff is. $160 for a camera? Checking for signs is half the fun of the hunt. All those warm early fall weekends leading up to opening day going out and finding tracks is what it’s all about. It’s like courting a girl. It’s not the kill, it’s the thrill of the chase. All that mess. Up around Goldthwaite, people have entire herds of blackbuck. I was driving down 84 a few times on my way through, and swore that I saw a large herd of deer in some guys field acting like goats or sheep (iow, just standing around grazing, not paying any particular attention to their surroundings). I asked one of the locals what I was seeing- turns out that they are popular there because the terrain suits them and they won’t jump a fence (although he said you need wider than usual cattle guards). I pulled over once (and got out of my car) to observe a buck in leisurely pursuit of a doe about 50 feet from me- and he completely ignored me the whole time. I think I need one of these for my backyard. Some animal might be opening my gate and I would like to see if it’s the wind, or a two legged critter. I don’t think you’ll have any problem hunting on that property. Wildlife galore. Never hunted, and unsure if I ever will, but thoroughly enjoy these posts, thanks! 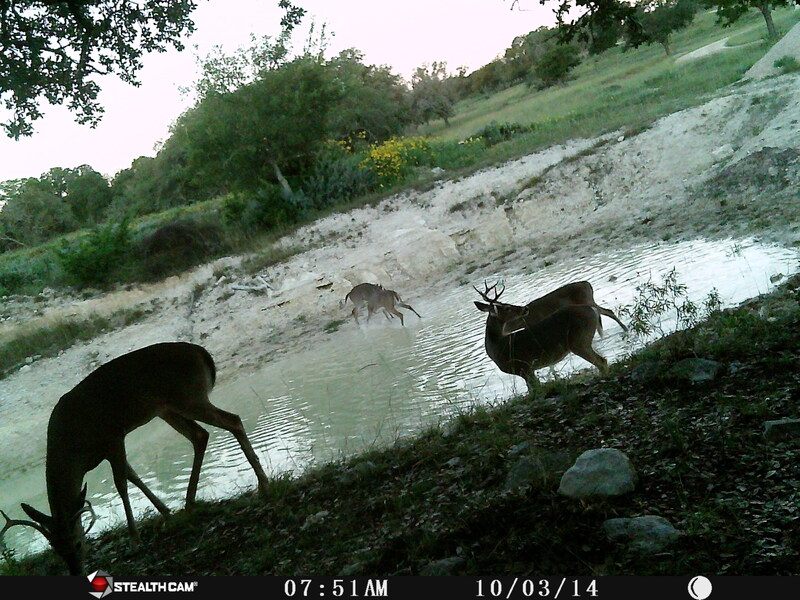 You have two things going on here that are pretty darn cool: A) you have excellent camera placement, as this water hole is a very popular crossroads for wildlife, and B) a lot of wildlife! It makes me wonder what is attracting and keeping all these large, healthy animals? Perhaps your neighbor’s outfitting program is attracting the wildlife and many of the animals choose to bed and water on your side of the fence? Or maybe I just need to park my trail cams in front of water instead of food plots so I can see this much activity, lol. In any case, $130 seems to be good value for the pics you are getting. I am mostly impressed with the quality of the IR pics, though I would like to see a little further out. Still, everything you showed here was comparable to a Reconyx camera, which is 4x mor expensive. 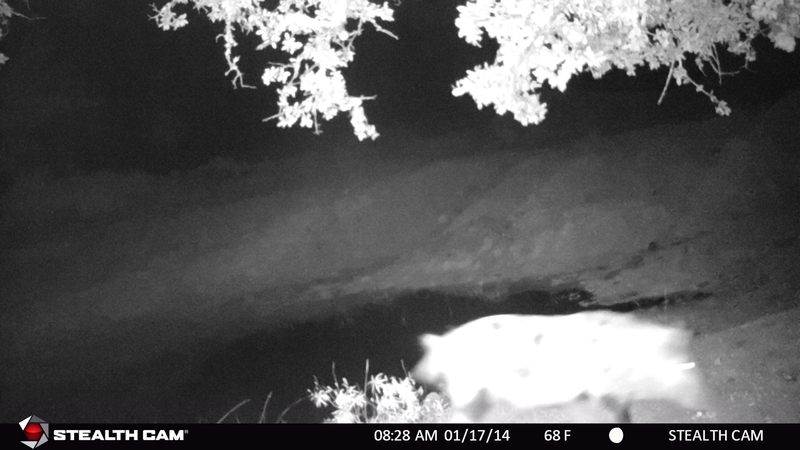 Is the IR flash on the Game Cam visible at night? … Also, your horse is a ham for the camera. That’s the toothiest smile I ever saw on a trail cam! 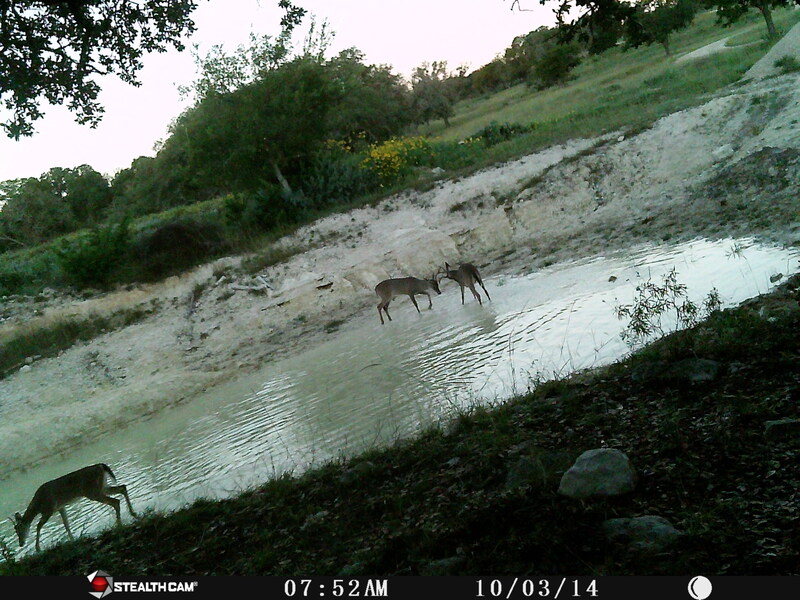 Our ranch is shaped like a trapezoid with the skinny part being towards the front where this water hole is. This particular area has 3 other properties within about 300 yards of it. One one side is a lot of really dense brush, then this watering hole with open fields. Normally there’s not water here, but we’ve had a wet year. Paired up with the oak trees that are dropping acorns and this is a pretty solid place for game animals to water and feed but have dense cover close by. I haven’t actively hunted it in years past, but I think I’m going to stake it out pretty hard this year. Expect a full and formal review of that camera. Its out there right now collecting video (hopefully), but once that’s done, I’ll post a much more in depth review. To my knowledge, the IR is not visible to the naked eye. And yes, that horse along with the rest of the herd like to ham it up. They think they’re big dogs. I just followed the link to the g30. They claim 80 feet IR vision, which is 20 feet more than Reconyx. Also, the price has jumped to $159. Hmm. Still a good value in my mind, although this is stretching my checkbook tolerance. If I decide I am ok with lower quality cameras, I can get two trailcams at Walmart for the same price. But then I will be probably be replacing cameras more often, because I don’t take my cameras down… They run all year. If the G30 can hold up to freezing weather (think -25, as the windchill gets that low at times here in KS, and lower in CO), they will have outperformed Reconyx in my mind. Their websit doesn’t make any claims about weather tolerances, though. I am looking forward to a full review, and a picture of you holding a blackbuck! Thanks Tyler! My bad… I guess it was already set at $160. For some reason I had it in my head that it was $130. I was wrong. Has anyone ever thought to combine a trail cam with a cellphone (and a solar cell panel to charge em)? Then once a day – week – whatever download the pics? The issue is that they’re pretty expensive & they require some sort of cellular activation to work. Great photos, Tyler. I don’t get to see cool stuff like that in my backyard, so I’ll have to live vicariously, for now.